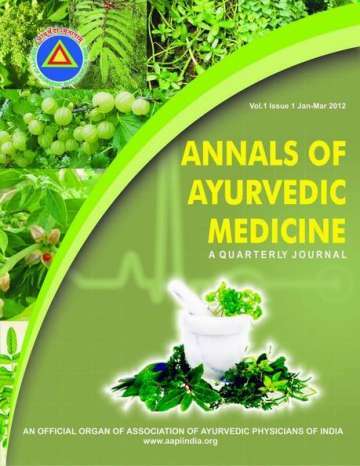 Annals of Ayurvedic Medicine (AAM) (An Official Organ of Society of Ayurvedic Physicians of India (SAPI)) invites contributions from authors for their prospective publication in AAM. The contributed material should be related to Ayurvedic Medicine with element of new reporting, new findings and novelty. We welcome articles in English. These should be relevant to the aims of Society of Ayurvedic Physicians of India (SAPI). The manuscripts should be typed in English in double spacing with wide margins and should be numbered beginning with the title page. Research papers should be divided in to Abstract (up to150 words), Introduction, Materials and Methods, Results, Discussion and References. Cover Letter : Should contain only (1) Title of the paper, the names ,affiliations and the addresses of the authors, (2) Short title not exceeding 40 letters, (3) Name and the mailing address of the corresponding author to whom correspondence should be sent. Main Article: Should contain the title , Abstract , Key words and the main text only. Tables and graphs should also be included within this file. The main article should not reveal the author name or identity in any way. It should also not contain any other component in the text which may reveal the authors identity. 1. Authors are suggested to refrain from translating fundamental words of Ayurveda in superficial English parallels. Following is a good example how these translations can adversely affect the whole flow of text : Acharya Sushruta has quoted health definition, “Health is the complete state of equilibrium of Dosha (humors), Agni (digestive power), Dhatu (body constituents) and Mala (proper excretion of waste products) along with mental, sensory and spiritual pleasantness’ and happiness of an individual.” In this text we need not to add prefix to sushruta and we need to understand that Dosha are not humors, agni is not digestive power, Dhatu are not body constituents and mala are not merely the excreta and essentially they mean for much more than what can be explained by their near English translations. Table should be given a short informative title and should properly be referred in the text, should be numbered and should be presented at the end of the manuscript. Figures (if any) should be submitted electronically in JPG format or otherwise as requested. Each should also be provided with a figure number, a suitable title, any legends used within the figure and should be properly referred in the text. References: The Pub Med system should be uniformly used for references. References should be cited in the text by number in square brackets followed by a list of references in square brackets at the end of the manuscript. Singh RH. Exploring Issues and Anomalies in Ayurvedic Education . Annals Ayurvedic Med. 2012; 1(3): 58-59. Standard abbreviations for the journals as are recommended in PubMed are to be used in referencing. I Dr. _________________________________________ do hereby certify that the submission ID…………………………….entitled_______________________________________________________________________ _____________________________________________________________________ submitted to Annals of Ayurvedic Medicine (AAM) (An Official Organ of the Association of Ayurvedic Physicians of India (AAPI)) for publication is my original and unpublished work and that I have not copied the same from anywhere. Where-so­ ever, data/tables/figures are quoted verbatim necessary from some other publication, I have given proper citations to the previously reported works and that the required permission to do so has been obtained. I hereby indemnify Annals of Ayurvedic Medicine (AAM) (An Official Organ of Association of Ayurvedic Physicians of India (AAPI)) for any sum or action, if the same is found copied or claimed by anybody. I also take the responsibility of the originality of all the contents of the manuscript on behalf of all the contributing authors listed to the manuscript.